Warping – Do you notice any sticking when opening or closing the door? Are there large gaps present when the door is shut? In some cases sticking is due to an even larger issue – warping. Warping can become a major problem, especially for older doors made of wood or if your home is located in a humid climate. Weathered and Worn – What is the aesthetic condition of your entry door? Is it cracked, dented, rusted or otherwise damaged? Some doors simply require a new paint job and they are good as new, but for others the damage may be more severe. If the threshold, frame or door-jamb have become loose or warped this can all contribute to the functionality of your entry door. Lack of Function – Does the door open and close seamlessly? Are the locks outdated or worn down? Have the door hinges rusted? If your entry door frame is made of wood, has it began to rot? Stick To One Manufacturer – If you are purchasing the entire door-and-frame system or a complete entry system, be sure all components come from the same manufacturer. Low-e Glaze – Look for low-e glazing on window units. For added security, some manufacturers offer glazing designed to resist break-ins. Weather Considerations – High-quality steel and fiberglass doors have a thermal break — often a vinyl strip or part of the wood frame — that separates the inside and outside door skins. This prevents outside cold and heat from being conducted through the skin and frame, and frost from forming on the inside surface. 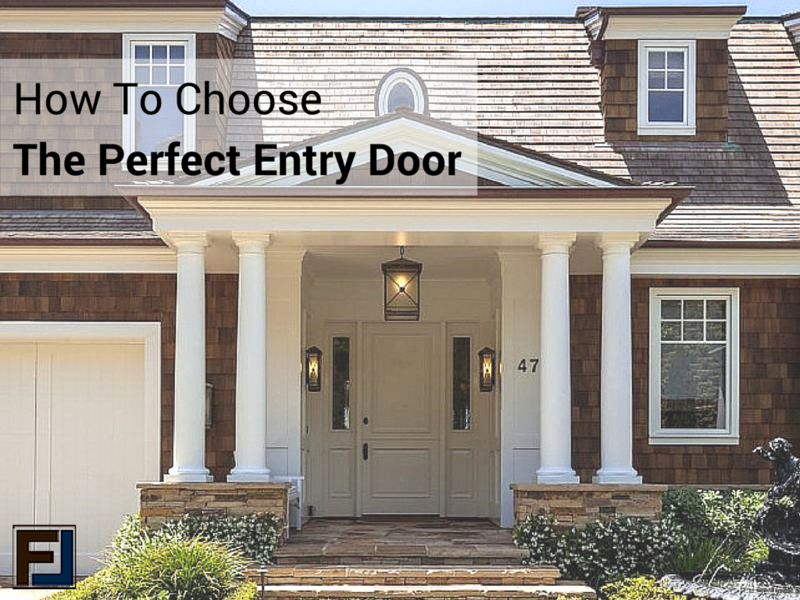 When shopping for a replacement entry door for your home, you should understand the various options for materials before choosing the one that’s right for you, but with all these features to consider, how do you know which one to choose? At Frontline Windows & More, we offer a variety of options to give your home a new look. Read on to learn more about exterior door options and how to choose the one that’s right for your home. Vinyl Doors – Vinyl doors are a top choice for high-moisture climates because they don’t absorb moisture or require painting. This means you can count on very little maintenance with these doors. Like its window counterpart, vinyl doors are exceptionally energy efficient, so they help keep your home cool in the summer and warm in the winter. Fiberglass Doors – Fiberglass doors are also weatherproof but with the added benefit that they can be designed to match the beauty and grain of wood doors. Fiberglass doors are much easier to maintain than wood because they endure temperature changes without swelling, scratching, or warping. Aluminum Doors – Aluminum doors offer a clean design at an affordable price. Architects and builders value aluminum for its strength and flexibility to maximize outdoor viewing. Built to resist rust and mildew, aluminum doors come in a wide range of colors to match your home’s style. We offer both standard aluminum doors for mild climates or thermally improved aluminum doors for extreme weather conditions. Added Curb Appeal – Your front door is the first thing people see when they enter your home. An efficient and secure entry door can also add to the overall value of your home. Energy Efficient – A good entry door will also be energy efficient and help you to save on your monthly heating and cooling bills. In fact, if you choose an energy-efficient exterior door, you may reduce your energy by 10%. Safety and Security – We also depend on our entry doors to provide the first line of defense against burglars. By taking the time to really investigate the benefits of each type of door, you have a better chance of choosing an entry door that will provide your home with a reliable, low-maintenance, and added energy saving investment. You’ll also have an elegant entry that makes a great first impression for years to come. If you’re ready to replace your entry door and want to start shopping your options or are looking for entry door installation services, please contact Frontline Windows & More. Our professional entry door technicians have been repairing, replacing and installing new entry doors, energy-efficient windows and more, in southern California since 2005. Talk to one of our design specialists by calling our 24-hour call center at (877)-367-1054 or fill out this form to schedule a FREE in-home estimate today!